Black tape around all edges (Required if grommets are provided). Provide brass grommets on 2 ft. centers. You won't always be able to find a shade cloth in exactly the size you need for your application, that's why Greenhouse Megastore has made it easy to order custom sizes to any dimension that fits you. Just enter in the correct information above, and if everything looks all right, add the piece to your shopping cart. It's that simple! Order anytime, 24/7, and no phone call is necessary. Please read the instructions below for more details on custom pieces of shade cloth. A $20 minimum order charge will be applied to custom shade cloth purchases less than $60 in value. This charge will be added if the total value of your custom shade cloth purchase is less than $60 (not including other products, accessories, sales tax or shipping). Please contact Greenhouse Megastore customer service if you have any questions regarding this fee. Greenhouse Megastore guarantees +/- 4" to your specified dimensions. Accuracy has only very rarely been a problem, but keep in mind these variances. Specially cut and custom fabricated items including but not limited to polyethylene film, polycarbonate panels and shade cloth are not returnable. We will, however, exchange any defective items. Specially fabricated items that do not meet ordered specifications (within stated tolerances) will be replaced upon confirmation of discrepancy by Greenhouse Megastore or the manufacturer. Customer may be subject to additional shipping and handling charges if it is confirmed that returned pieces do indeed meet stated tolerances. Ordered two 9x11 with black tape around the edges and grommets on 2' centers. Two problems: 1. The black tape frays at the edges. 2. 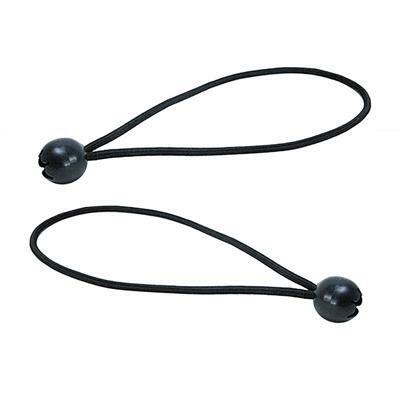 More importantly the only way we could tie the two together is to flip one of them upside down since the grommets were not positioned so that the two could be tied together. 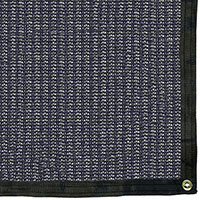 Since the shade of the fabric on the underside is darker than the shade on the top; the sun protection is also effected. Disappointed. This was my second custom order for Aluminet shade cloth for my GH. I am always impressed with the quality of the custom finished sizes and super fast fulfillment of my order. Thank you! This product came MUCH faster than it said it would, which was GREAT!!! It came exactly as promised and expected. Fits perfectly and .....nothing else to say! Very satisfied! Have purchased a few times 80% shade cloth for the patio and surrounding areas. Works great. i ordered two green 70% shade tarps to cover my grand childrens outdoor play area. the tarps came two weeks sooner than expected and were exactly as per advertised. they look fantastic and do exactly what i had hoped for. they have only been up for about two weeks so i cant speak about longevity yet but i am hoping to get a few years out of them. I love growing dahlias, but our climate reaches into the 100's in July and August. This is my fifth year to have a dahlia garden and It has stuggled in our climate. This year We built a support structure and I ordered a white 50% custom shade tarp to cover the dahlia garden. What a difference this has made to my garden! The tarp arrived earlier than expected and its very well made. My garden is protected from the harsh sun and the plants are thriving. We live in a windy area but the tarp has held up very well. I will take it down for winter and it looks like it will last a few years. Even if it only lasted one season it would be worth the cost to order a new one every year. Really does the job, feels cooler under it. Our tomato plants are thankful and we too! This item provides much needed shade on a patio, and allows enough air movement as well. It replaces a 90% black shade cloth that made things hotter. The netting is just as described. The workmanship looks great. The hims and grommets look good. I don't think there is anything at all that isn't perfect. I can't say anything about the durability because I just got it, but similar products in the past have had very good durability. The price seemed very reasonable. I am very happy with this. Ordered a 13x9 80% shade cloth for use over our patio. Great quality and construction. Ordered a custom sized shade cloth in the aluminet material to cover my existing deck cover which seemed to be baking my family underneath (a milky corrugated material). Noticeably improved the temp underneath- was easy to install with the grommets. Highly recommend. Very pleased with the quality. Measurements were right on the money. Using this on top of a pergola and oh what a difference it makes, wonderful! Spend a couple bucks and get a roll of lacing cord and needle to help secure it in the center. This is a great company to work with. The sun shade works perfect for our pergola, I gave this a 3 because despite being a custom size order the shade was too short on one side by 3 inches and almost 4 on the other. I did not read in the specs to expect these differentials. I reordered a larger shade not custom size and only received a 10% discount. So word to the wise read all the specs first. I'm still confused how a product can be a custom size but come smaller. Work to keep heat off sliding glass doors(3) sets. Bought 6, 2 for each door.Terrific results.Great quality and extremely durable. Used in previous home, lasted 6+years and going strong when we sold house. Strongly recommend. Awesome to be able to get the perfect fit for my project! Only thing I was disappointed about was the way they packaged the shade, they kinda stuffed into the smallest box possible, so when I got it, it was very wrinkled, I'm paying for shipping so it should have been in a bigger box so's not to wrinkle it. Love the shade it provides a lot of shade where I put it. Wonderful product!!! It was the perfect size & the quality is excellent! Fits and works perfectly. Decreases the temp under my pergola by 10 degrees. Very well made, but the 40% shade is not (nearly) dark enough for my application ... ordering darker ones. Not the super heavy duty 30 year stuff. I would by the looks of it give it a good 7 years. If you want it now go with this. I ordered it custom 40'x40' and it was here in a week. 30 year stuff took a month and a half from a local company. Very satisfy with this product this is a second time I purchased same product. GHMS, I ordered 3 custom size pieces of 90% Shade Cloth. They all arrived very quickly. Upon installation they work great. They were spot on size wise as well. Now our show calves are enjoying shade from the Hot Texas Sun! Great product! 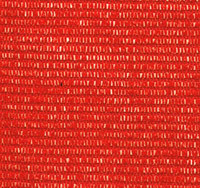 Shade cloth 50% sun shade, custom size, very nice finish on edges. Used to cover some fruit, avocado, lemon and lime trees-Trees doing Very well protected from the hot desert sun in Arizona.Thank you. Awesome Quality, with Great Durability.Perfect shade cover,10 -20 degrees cooler over my small green house.I will be purchasing more of these. The fit was excellent but I wish the weave was denser to give more shade. I also would have liked the grommet holes to have larger openings. It was hard to find hooks to use with the size grommets. Maybe offer hooks for sale with the tarp. Arrived quickly and is doing a great job. Also, the customer service was excellent. This is the perfect shade cover for our pergola. It lets the water through and keep the sun out. It doesn't mold and keeps it's shape. Love the color and fabric it looks fantastic. We had been spending $100 every year to replace the old fabric cover and this one was costs so much less and offers so much more!!! I give it a 5 so far because I just got them. I ordered 2 different sizes made from different cloth. Both seem well made and are both providing shade. One for a garden and one for a dog run. Cut to correct dimension. Fairly quick delivery. I have ordered this product oreviously and loved them. They do an incredible job of reducing the sun load. The beige color is beautiful and functional. I thought it was done really well. The custom shades have been up about a month, and they were put together nicely. You can tell that whoever put them together really paid attention to the details. The grommets were purposefully offset to be able to achieve max taughtness. There was also a handwritten label on each one; that was a nice touch.I would leave five stars but haven't had them up long enough to know if they will stand the test of time and elements. Perfe3ct. Exactly what I ordered and precisely the correct dimensions. Perfect fit. Excellent product. I got exactly what I ordered. Prompt delivery. I will be making future Purchases from this vendor. High marks for Greenhouse Megastore. I ordered a number of custom shade cloths. One shade cloth didn't arrived/was missed on the order. GHMS made sure I got my missing shade cloth. Thanks! We purchased our customer ordered 70% white shades and they work well! We have them on our outdoor wedding venue, in case of high winds or rain. I promise you, when this company says it keeps out 70% that is what it does! Almost keeps all of the wind and rain out! We are placing another order for our other barn!!! They are well worth the money. Easy to install, ready to tie back, and look good! I just put this on a few days ago. So far so good. Measurement size was correct and it went up well after purchasing screws and washers. Possibly only regret is color selection. It makes the pergola and everything underneath it look green. My pergola is a tan color so maybe a more neutral matching color would have been better. This cover is as good if not better than the original cover. It's quality constructed and should last for many years. I'm really satisfied with this purchase. I have years of experience with 40% black shade cloth. It has performed well and survived the sometimes harsh Texas weather . I have covered both greenhouses and shade houses with success. My last order included 40% white shade cloth While I like looks and light quality. I am NOT satisfied with its durability. The first windy day, I had ripped seams and random holes. Can't say I'd recommend the white cloth. 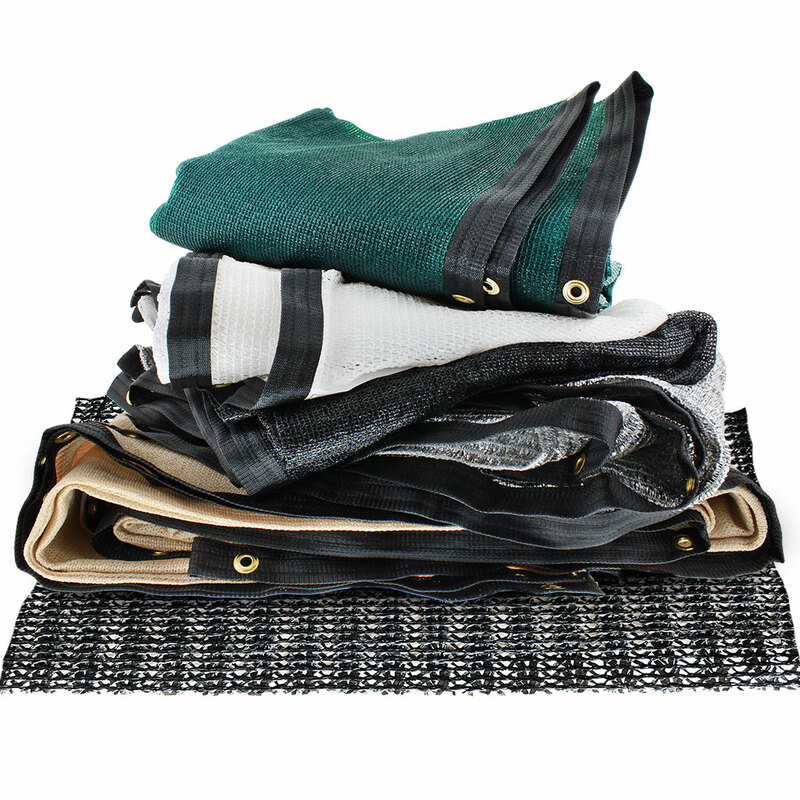 We love our shade cloth and were surprised when it came to us pretty quick. We were expecting a 6week delivery and got it within 3 1/2 weeks. So far its great for what we need but will find out in summertime. We are already thinking about ordering another for a new garden but are waiting for summer to see if we need to order a shade to protect our plants more. The shade cloth I ordered was exactly as advertised and arrived in a timely manner and well packaged. I've installed it and early indications are that it is of good quality and performing well. Thanks! came as ordered. looks to be a good fit and finish. should work well for the application. I made the mistake in believing the literature I read that said you use 50% shade cloth for growing tomatoes. Its too much shade. I'm taking a crap-shot with 22% cloth. In just two week I can see the difference in plant growth. I used plastic grommets to tie it to a wood frame. Somewhat of an irritate is - it stretches, 3' in one direction and 2.5' in the other direction. Other than that it's great so far. I ordered a custom sized shade cloth for my patio cover and it came sooner than promised, was cut perfectly and looks great. It fit my patio like a glove. I wouldn't hesitate to order from your company again and likely will in the future. Highly recommended. THE BEST! THE BEST! THE BEST!!!!!! I was very surprised at well it fit and how good it looked. The measurements were spot on. The product is made of durable material and is made to fit your needs. This arrived very quickly and exactly how I ordered it. PERFECT! the shade cloth came as ordered. the quality was lacking as there was numerous stitching mistakes. once stretched out & fastened down it looks quite good. needed additional grommets at 1 foot intervals. one more shade section to install. Product was exactly as described and works perfectly. They delivered on every promise. Received promptly, was the correct dimension and well fabricated. Looks to be made of durable material and I will report later on the wearability ( is that a word?) Thanks. Well made product and very competitively priced. Bought the product to cover an area 8'x16' with a small fish pond & shade loving plants. Previously used the 6' wide rolls of shade cloth bought at a big box store & which were a pain to maintain with leaves accumulating in the overlaps and wind blowing them loose. This custom cut cloth fit perfectly & should eliminate all those problems. I probably could have gone a little darker but as it turned out I first left one of my old 6' strips over the pond & then installed the custom cloth over it and the rest of the area. Now my pond gets great shade which will hopefully eliminate future green water & my plants get the shade they need without being too shady. The quality of the product seems to be excellent & I expect it will last for many years. Easy web site to order custom shade. Great pricing and great product.The product showed up weeks before the said date. So far this shade cloth appears to be of a high quality. If it lasts the 10+ years I expect it to; I will be extremely happy with it. Product ordering was easy, delivery on time, however, one of the eyelet grommets started tearing the sun shade in one day. There wasn't any winds to speak of, I used Kotap BB-9B Ball Bungees every 2 feet in each grommet that were just taught, not stretched much at all. Other than that, the products ability to shade the sun is amazing. My experience reminds me of the comment made to Mrs Lincoln, Other than that, how was the play?. I use this shade cloth for a sun blocker on a fabric garage. I've purchased two so far and the sizing varies. One just fit and the second was oversized. Both work and they last quite a few years. Beats buying a new fabric cover. Very satisfied with the ordering process, status updates, delivery and the final product. This shade cloth will be used over our deck. Given our house design this cloth shades the summer sun from the living area and is removed to allow solar heating during winter months. Thanks. The absolute best company and product on the planet.Thank you!!! I purchased this to hang in my run in shed for my horses as the afternoon sun was heating up the shed quite a bit. Works like a charm! I did have to weight the panels at the top and bottom so it wouldn't fly around. Horses are happy so I'm happy! We were looking to add a cover/shade to our deck. This screen cloth is perfect. Just the right amount of shade to bring the temperature down, still lots of light. Feels light and airy underneath. This is the second cover we've ordered. Excellent quality both times. Both were used as pergola covers. This shade is a lifesaver. It took a little to put it up (we're in our 70's, but it was so worth it. We still get the air, but the sunlight isn't as blinding as it was. We were going to take it down after the summer, but because it was a bit much to put up for us, we'll just leave it up and if it rots we'll just order a new one. I purchased the shade cloth to cover the roof of my dog's pen. The pen dimensions were not standard so I requested a specific size. The shade cloth fit well and was easy to secure with zip ties. The quality was good and the cloth had no defects. I received it in a timely manner. Well made and gossamer. Easy to hang, provided that comfort area on a very hot deck. I love it! My shade cloth arrived about 2 weeks early. Thank goodness it did as the next day it was 102 degrees. I had planted new grass and the shade cloth saved it from burning up ! The product looks great and will help shade my raised vegetable garden. Seems of reasonable quality and shades plants as promised. Time will tell if it lasts ten years. Turnaround time was much faster than expected for a custom cut with grommets - only 2 weeks or so. Ordered shade cloth before and always happy with it.Heavier than what you buy at Home Depot or Lowes.Love the grommets. Wish they were every 12 inches instead of 24. Sometimes add my own for unusual dimensions. Surprised I like the black. Silvery sheen. Bought premade shade that fits my greenhouse. Needed another for the west end. 80 %Block. Very happy with it. So far so good, I just hope that it will hold up under the Sun. the seam and groments look just fine. Received in a timely manner. Product size was exactly as ordered. Secured it with stainless steel ties. Good fit, cooling effect very noticeable , should last for many seasons. I like the product but I ordered two shades one at 5' x 14' one at 5' x 18. I wanted them to be even at 5' however one came at 5' the other at just under 6'. They had an inspection tag with the correct size on it but that is not what they measured. Waiting four weeks I didn't want to send it back. I needed a shade cloth. I requested a specific size. It arrived in better time and was perfect. I would recommend the quality and durability of this product. Plus it looks better than the canvas I replaced. We are very happy with the sun shades that were custom made for us. Excellent quality and exactly what I ordered and expected. Really appreciate the personal touch of the sewn-on tag with the makers hand-written shade data and name - Maria. Thank you for a great product. I have purchased three times. I use it for shade over my summer garden as it gets too hot here in the summer. I put it on my iron fence to keep the wild critters out. The riveted banding made the job easy and looks professionally installed! I also put it on my patio cover. The riveted banding makes all the difference in ambiance and ease of installation. I highly recommend these well made shade covers. Well made with edge stitching and made to the exact size requested. Threads per inch is less than I had hoped so sun still comes through. Very satisfied with item and short amount of time it took to receive it. Will shop with you again. Works well as shade fir my chicken coop. Glad I chose white to reflect heat as well in our hot climate. easy ordering, came exactly sized, quick install, cools greenhouse 15-20 degrees. Recommended! I have to say that I love my custom canopy. I recently built a pergola that is 14' x 10'6 and I needed a cover for additional shade. This looks great, fits perfectly and arrived fairly quickly. We are all ready for summer now. Installed 3 days ago and looked out today and there is a hole. Will try to stich it. Used this product in the past two years with good results. Just as I ordered, Quality is Excellent and shipped on time. Purchase with confidence. I bought this custom built shade cloth together with lacing cord to go over my deck. I used 2-10 1/2 ft fencing top rails for each side and laced up shade cloth to top rails. I ran aircraft cable through the rails and used it for support above deck. It is a nice and tight fit. The wind does not blow it all over the place and should last a while. I plan on taking down in winter for storage. Plants look great and safe from hot sun. This came exactly as ordered and fit perfectly. I've used this before and it is a wonderful cover for our patio. Price is good too. Perfect size for what I need. I'll purchase again. We purchased the 50% in black. It is just what our Pergola needed for plant growth without burn. Looks fantastic on top of the pergola also. We opted for the grommets. I got my custom shade cloth as promised and got installed in good order. It does everything I could hope for.I bought this product to help cut down on the high UV rays from the sun that quickly dry out the garden after we water it. This does do that as great as can be expected as we are watering only once per day as opposed to 3 and 4 times per day. Can not wait to have the second cover installed over the large raised garden bed soon. The custom shade cloth was made exactly to my specifications followed by very quick shipping. I definitely would recommend this vendor for this type of product. I ordered a custom 50% shade cloth in white, dimensions 12' x 16' to use on the outside of my lean-to greenhouse. The product fit perfectly; I installed it in about half an hour using a drill and eye hooks. This particular material gives a very bright appearance but still cuts sunlight; since it is white it does not heat up like black shade cloth. It reduces temperatures inside the greenhouse by 20 to 30 degrees F. The product arrived 10 business days after order. Disappointed that every 3 feet would see a seam straight down middle of shade cloth. Also seems that the cloth itself has larger holes than other 50% shade cloth, therefore easily snagging. Disappointed with this shade cloth and would not order again u less I purchased 2' or 3' sections. Good quality and service on this shade cloth. Delivery was fairly fast for the cloth. I like the shade cloth, but they forgot to put the grommets along one side of it as requested. Luckily I know how to do it myself. Just what I ordered. Fit perfect and was everything they said it would be. Great Job. I received my custom sized shade cover and was delighted. I have a greenhouse of odd size and required a 38'x38' shade cover. I opted for the black 50% with the ribbon all the way around. It was exactly the right size and the ribbon material all around made for clean, finished look. Good quality.Works as advertised.The measurements were right on so far it is working great as a cover for my garden. We chose the brown color, which is more of a tan. It is perfect as a covering for our deck. It allows just enough light for our plants and still allows rain. It fit perfectly, too. Will definitely use this company in the future if I have to get another one. This is my fourth order from greenhouse Megastore. I use this to at least try and keep our 10'x 20'greenhouse below 120 degrees in the summer. The shade cloth works great in protecting the plants from too much sun, but the greenhouse still got too hot. This last shade cloth was installed with an air gap between the greenhouse roof and the cloth. We will see how cool it keeps the greenhouse now. All of the previous shade cloths are still in use and are in good shape after four years. Putting the air gap there will also protect the greenhouse glass from hail stones. Great product. Well made and fits perfectly. Easily installed using 3/4 inch conduit and shower curtain hooks. Quite impressed with greenhouse shade product. Cloth was manufactured and delivered quickly. Installation was easy due to accurate measurements, groments, and reinforced edges. The cloth was so much better than similar products I've ordered from other manufacturers. Hope to get use from this cloth for several years. Have ordered several shade clothes over the past few years - always just as ordered! fast delivery. I won't be using this until next Spring so I can't comment. Just installed the shade screen so I can't address how it will stand up. What I can address is that the product seems to be exactly what I purchased. It was made to the size I specified and provides the shade I want. The only reason I haven't given a 5 (perfect) rating is because of the struggle I had with the fit. We had the black edging sewn along all of the edges. On one of the edges there was a significant amount of puckering which made that side about 1 inch short. I was able to stretch it enough to make it work - just barely. A little quality control inspection would easily catch and correct this problem. I received the custom sized shade cloth I ordered and the quality workmanship will keep me being a customer.Thank you! Product is well made, size was accurate. Using it vertical on a boat dock. I got the 70% block.Very good at providing enoughShade. The only con is the color. I ordered orange and it is more of a safety red color. All in all, I'm satisfied with the endResult. I purchased the 70% shade cloth as a sun screen for an elevated deck. The custom size allowed me to place it as two panels beside each other, to allow for an opening for walking through. It works exactly as I had hoped it would. I can highly recommend this product. Rather hard to guess what percentage of shade cloth you want. I got 30% and to me it's the same as no shade. I guess you learn the hard way about things. 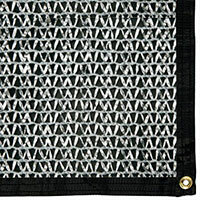 We were pleased to find a place that sold order-to-size shade cloth, especially with hems and grommets. It was easy to install, was the correct size, and provides just enough shade, making our new deck usable. Shade cloth came on time & custom size was perfect.I will be placing another order within a few days. I love this shade clothe it provides great shade , material last a long time and I like the fact that you can custom order your pieces . I have a 20' x 20' that is about ten years old and is still as good as new and is outside year round . Received just what I ordered and am very satisfied. 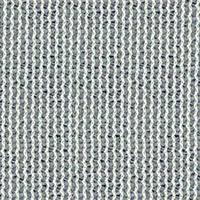 Ordered 9x12 hemmed and eyed shade. Received a lot quicker than expected and size was perfect. Once up, shade was perfect. Couldn't ask for better. Only unknown right now is durability, but if it's the same as everything else, that shouldn't be a problem. We live in the high desert of CA. Sun is intense in the summer. Greenhousemegastore's shade cloth is an excellent protections for sensitive plants and water conservation. Great quality. We have the 70% blockage cloth.Takes time for delivery but worth it. I really appreciate that I can get the cloth cut to size with binding and grommets, no less. Saves me a lot of time and effort. The cover looks good and was easy to install. 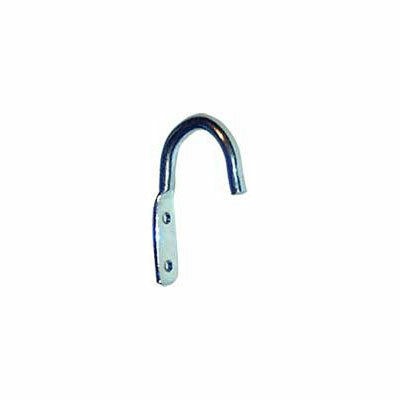 It also is well made and the grommets are great for attaching to the wood slats. I ordered 2 black ones that held up through two rough winters and summers so far. My only complaint would be the 4 weeks wait for it to ship. Purchase a shade tarp for my awning, it cost a pretty penny because I had the size custom. When i rcvd the producted and started to place it on my awning, I notices how easily torn it gets. I immediately compared to a Home Depot brand that I had and the Home Depot brand was much more of a tougher material. thought when I was buying this product to shade out 70% UV rays that it was a quality material, I was wrong. These shades are very nice. Made to order. The only thing I don't like is the contrast of the black trim. I knew this when I ordered them. I have a covered deck and get direct sunlight in the late afternoon. I needed something to block the sun. These work perfect on my Champion awning. Will be easy to take down and store away for winter. I ordered a shade cloth to cover my exceptionally large, very hot, west facing patio in my back yard. I had seen this product at a dog breeder's home to provide shade for very young puppies. The cover not only provides great shade control it has reduced the indoor temperature of the adjoining rooms by 10 degrees! The house is much more comfortable too! Fit and finish were excellent. Came in exactly the size ordered and appears to be exactly hat I as hoping to achieve in shading the garden. Time will tell on the quality of the material. Quality product and workmanship. This is the second purchase of this product, with this one being at 90%, vs. the 80% previous shade cloth. What a big difference this make in cooling off the deck. Our very hot summer sun in Florida is all but negated when using this product. Even though it's rated at 90%, you can still see through the shade cloth which helps prevent the shrinking down of the deck syndrome. Absolutely recommend this prooduct and this company. NOTE: when measuring, plan on reducing overall size by at least one foot on all edges to allow for bungee cords/hook-up. Received our customer sun shade. It fit perfect and works just like it is supposed to. Thanks. Finally found the perfect solution to keep us cool in our pontoon boat while we are docked. Use bungees with it and ... No more heat or harmful uv rays, yet I still have my beautiful lake views and cool breeze..thanks so much I have tried everything and this is PERFECT. great workmanship on the tape and grommets too! This is the second order I've placed with you for custome shade cloth. As in the first order, made over three years ago, the quality of the cloth and the finish work are excellent and well-priced. The three year old cloth, despite being in the elements all year long, looks as good as it did when it just arrived. I'll be coming back for more. Thanks! I purchased a 9.5' X 16' shade cloth for my pergola. It was hung on the inside of the top to give some shade. We hung it with ball bungies on each grommet and added 5 strings of cable across for extra support. We have since had many rain storms with wind and it has held up very well. Super value and does what it is designed for. Love the shades I bought. Fit perfectly except for the missing grommet. It's in an area I really needed one. Think I have an extra in my garage. Shade is on my greenhouse. Will be tricky adding the grommet standing on a ladder.Of course it was the last area to put up. Wish I had known about buying the shade cloth already made. My old shade I bought the supplies at store and put the grommets in myself. I made a second purchase of this product due to adding on to existing greenhouse. This product does a great job of providing shade and light at the same time. Would highly recommend this to anyone! Very pleased with custom size and workmanship of shade cloth ordered. Just what I needed! Just what I ordered . Very well made. I will buy again. Received with a hole in the material, about the size of a nickle. Box was fine so it must have been shipped that way. Advertised grommet spacing was 2'. I would think that would be the minimum distance for a grommet, so a 28 side should have 3 grommets. The long side the grommets where not symmetrical and space more than 2'. I emailed the company a couple weeks ago and did not hear anything. I have done business in the past with green house megastore and never had problems. So far this is great, made exactly to size. It is providing the perfect shade to my pond! The product is exactly what I asked for. It came quickly and is of superior quality. Fantastic! 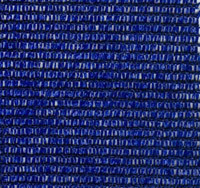 We ordered a custom shade cloth to cover a pergola for summer use. The cost was competitive with what we would have paid for the same amount of shade cloth at our local hardware store, but it has grommets all around it for installation. Before finding this, I was worried about how I was going to mount it. After we ordered it, it showed up more quickly than expected. Installation was a easy with the grommets, and the sizing was spot-on. The order arrived promptly. The shades fit very well.The material is of high quality. The panels block most of the sunlight coming in. We were hoping this would cut some of the heat from building up in our greenhouse - this does not seem to be happening, maybe a 5-10 degree difference. This may improve as the sun climbs to a higher angle. I put it up last weekend and it seems to be working perfectly. Although we haven't had much sun in the last week. I had a shade sail and so far, I like this one a lot better. The product was delivered to my door in a few weeks. The custom shade dimensions were shorter than the dimension provided on the length. Width was correct. Easy install. I'm satisfied with quality for the price. I would buy this product again. Great shade for a pergola. Good quality. It arrived quickly and was easy to install with the grommets every two feet. I'd buy from you again, no hesitation. I PLACED MY ORDER FOR A CUSTOM SHADE CLOTH TO COVER MY DECK. REALIZED THE NEXT DAY THAT I HAD ADD THE INCHES TO THE OUTSIDE CENTER BEAMS TO THE WRONG SIDES. I CALLED CUSTOMER SERVICE AND ASK IF THERE WAS ANYWAY TO CHANGE THE SIZE. I WAS TOLD THAT THEY WOULD TRY TO CONTACT THE MANUFACTURE, THIS WAS FRIDAY BEFORE A HOLIDAY WEEKEND, THE CUSTOMER SERVICE REP CALLED AND TOLD ME THAT THE MANUF. WAS CLOSED THE FRIDAY I CALLED BY THEY WERE ABLE TO CHANGE THE SIZE. WHEN MY SHADE CLOTH ARRIVED A FEW WEEKS LATER IT WAS THE PERFECT SIZE. I INSTALLED IT IN ABOUT AN HOUR. I HAD PLANNED TO INSTALL TURNBUCKLES AND CABLE AND LACE THE CLOTH TO THE CABLE BUT A DIFFERENT CUSTOMER SERVICE PERSON AT THE GREENHOUSEGEGASTORE TOLD ME THE CLOTH WAS LIGHT, TO PURCHASE SCREWS, WASHERS AND SOME LATH AND THAT SHOULD BE ALL I NEEDED TO DO USING THE TWO FOOT SPACED HOLES. IT HAS BEEN GREAT THE CLOTH BEARLY RIPPLES WHEN THE WIND BLOWS. 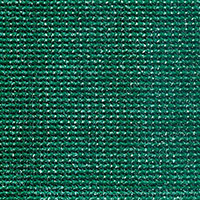 I FEEL I RECEIVED FANTASTIC CUSTOMER SERVICE AND A GREAT SHADE CLOTH IN THE GREEN COLOR, FOR A VERY REASONABLE PRICE. THANK YOU FOR ALL YOUR HELP,I AM VERY HAPPY WITH THIS CHOICE TO REPLACE MY 35 YEAR OLD GRAPES THAT HAD TO BE TRIMMED YEARLY. My cloth was mailed to me in a timely manner. Only being up a couple of weeks the cloth has formed a hole in it already. i am very disappointed in the quality of the cloth. i would think twice before ordering from this company in the future. Material and assembly quality so far has proven to be superior. Only in use for a short time and will see how it performs. Especially like the ability to order the size I needed. Items were an odd size to allow for openings in the carport not filled with other materials. So far working great. Has survived Two West Texas thunder storms, searing heat, Hawk vs squirrel incounter all in the two weeks it has been up and providing a cool shade. Check back in September. This arrive so fast. Bought it to shade our trailer. Absolutely love it was easy to put up and in long run will save us a lot to repairs for sun and rain damage. And a great price. We searched for weeks for what we wanted. Every thing about this purchase was good. The shadecloth appearance is great, love the grommets and reinforced black edges. It has been covering my deck now for just over a week, but unfortunately already has a small tear from some high winds we sustained one night. Thought the shadecloth might have been a little more sturdy than that. Delivery was faster than advertised. Thanks. It's great to be able to supply all my greenhouse needs in one place. Without shade cloth it's game over in the summer. very well made. nice features. shipped fast and well packaged. Well made custom perfect fit and the price was right. Quality product custom cut to my requested size has been installed over a redwood patio cover to obtain relief from the sun's direct heat. We achieved the perfect result...thank you! Easy to order. Good price. Size was perfect. Received within a few days. This was my third product I've ordered. Each met my expectations. I was told that if I sent it back, they would recut the existing product to the size that I specified. I paidfor shipping, was willing to pay for the adjustment, and they sent the original back! Oh well. I hope that I can cut it down and tape the edges securely. Very nice product. Just as advertised. Fast service too! A lot of vendors don't like to ship to Hawaii - even though we're part of the U.S. but when ordered from Greenhouse I got the quality and product I wanted at a outstanding price. Shipping was in a couple three days so I was VERY impressed and happy customer. Thank you. Unbelievably quick turnaround on my custom shade cloth order! Only 4 days from time of order to delivery. The web site said 4-6 weeks. I am was very impressed with both of my orders and will most likely order again and again for my greenhouse needs. Thank you! The product is of good quality and worked perfect for my needs . Arrived as advertised. Fast shipping. Grommets all evenly spaced and seams appear to be good quality. Only time will tell for durability to weather and hard UV exposure. Customer service person was very helpful. Online ordering was easy. Shade cloth arrived before promised date and was exactly what was ordered!!! I am very happy with both of my orders. I had a custom order and I wasn't expecting it for awhile and it arrived much faster than posted. I was thrilled to with the product and the speed of delivery. Does exactly what I wanted: deflects most heat but allows a breeze. The shade screen was delivered quickly. It was true to size and fits nicely on my garden frame. Couldn't be happier! The cloth does it's job! We were afraid that it wouldn't hold up, but it looks good, especially for the cost. If you have fixed attachment points, be sure you specify a size at least 4 smaller than the distances between points. I recommend 6. Otherwise you won't have room to tighten up the cloth to prevent sag. Product is very well made and the service was excellent - delivery quick for a custom cut product. I wish I went with a bit more shade. Perhaps 70% as the white is very bright in the sun and not as shady as I would have wanted. We stretched a custom sized piece of shade cloth between two buildings and it has made a significant difference in temperature outside. it has only been up a month so far, but it has endured some pretty ferocious winds. Edges and grommets seem to be holding up well. Bought it for extension for my pergola. Bought one about 4 years ago and still in great shape. Great value. I have a too sunny, too hot place between two parallel eaves. I measured the strip of shade cloth that I need, selected 70% beige and ordered. My order was delivered in much less time than indicated. The finished product was spot-on my measurements (although I did allow leeway). The resultant shade cloth does a great job is cooling down the area intended for.No doubt I will order again.I would ask, though, that triangle shapes be provided, even if the final price indicated an increased cost for producing the triangle shape.Bottom line, though, count me in as a 100% satisfied customer. I bought a 10x37 brown shade cloth they sent green, I called and they had the correct color here in 2 days and they told me to keep the green one. will buy from again and the dimensions were dead on with a little stretch, I expected that and it was perfect. it was a 70 percent block I would recommend going black with a 90 percent block to truly get a real shade feel. I am happy with my purchase, but due to lack of experience with this material I made the mistake of what I had envisioned and what I got. my fault I would recommend this business and buy from again. Shade cloth is not giving the results that I thought it would. There is not any shade with it being on. Waste of money as far as I am concerned. Wish I had my money back. I ordered a 40% white shade cloth for my vegetable garden. July and August sun in northwest Montana can be brutal, and my second planting of greens go from seedling to seed. Husband built a frame for them, we installed shade cloth and voila! Greens in July! Perfect for our needs. Looks very durable. Covered my back deck, could not walk on it bare foot in the Texas sun before putting the cover on it. We ordered a large (30' x 50') 30% custom shade cloth. While attaching the corners to posts, the binding tore and grommets fell out. We ended up gathering and tying the cloth to the posts. Should have just bought the bulk cloth and saved the money. Ordered the 50% aluminet with tape/grommets for the atrium in my home. Two eyelets anchored into stucco at each corner, zip ties through eyelets and corner grommets so I could get it taught.The day or two after instillation it became clear that the tape was failing at one of the corner grommets causing it to separate, so it's only a matter of time before that corner comes down.I contacted customer service and got a reply right away. I chose the partial refund rather than have the old one picked up for replacement since I don't want the plants in the atrium exposed to the Phoenix sun for however long it takes to get the new shade cloth.So all in all the product I received wasn't perfect, but the customer service was on point. I ordered the custom size and the product came quickly and was exactly what I was looking for. This cover is working just fine. I attached to the top of my 13x12 pergola with staples and a denim patch to the wood frame. This holds the cover down flat. All but one of my hanging plants are thriving with the reduced solar intensity! Thank you very much! If there was one improvement that I could ask for it would be to have a little lower prices! BTW Shipping time was fantastic for my cover. We ordered a custom sized shade cloth to put under our pergola on the west side of our house. It was the 70 percent light block in the light brown color and we absolutely love it. I never thought we would be sitting on our patio under our pergola at 1:00 in the afternoon on the 4th of July when it was 99 degrees out and full sun. Thank you. Excellent product. We hung two 4x6 blue grey shade cloths from our rain gutter just outside our glass patio room to stop the late sun, let us go out the patio doors and still let wind in. It worked great and the product is excellent. My orders are always cut to the right size and delivered within a reasonable amount of time. I like the ease of ordering on their website. Simply put....It was delivered way ahead of schedule, and it was a perfect fit to the measurements given.My wife has not stopped smiling since her garden got covered. The product description was brown, and the color is actually beige. No problem there, I wasn't that picky about the color, was looking for an earth tone, done. I hung the shade cloth, and within weeks the material has stretched significantly. I live in Southern California, so the weather was very moderate, mostly wind. Within two months, one of the grommets tore out, but I have been able to fix with a zip tie. Disappointing, even for the great price. i bought these custom shade cloth for my skylights. the holes were not centered on the long edges which made it harder to tie down. otherwise they are on my roof working. Fast response and delivery and great customer service along with a perfect product! Thank you GMS! The shade clothe I received was exactly what I ordered. This fits perfectly over our pergola and keeps our pool deck nicely shaded. Works great, size was right on. Great product. I recently purchased two shade cloths, with grommets. 8X10 and 8X12. These were put above my pergola to filter the intense Colorado western sun. I am extremely happy with this purchase. I attached clips into the grommets/pergola so that the shade cloth can be removed in the winter. The grommets are strong and were put into the cloth securely. The filtered sun is perfect. The sizes I chose were cut evenly and the color is just right-basically beige. All in all I am very happy with the shade and the quality of the product. Delivery was as quoted.thanks! Ordered a custom shade cloth and it was exactly the size I ordered and the binding and gromits were very sturdy. I'm very happy with my new patio covering. Fast delivery, quality was not acceptable. On a 4' wide shade cloth their is a seam all the way down the 80' piece. By the time it was installed it was too late to return. Came as listed. Good Quality. Would recommend. Shipment was much faster than I expected (2 weeks). The shade cloth is perfect! It looks great on my greenhouse and provides just the right amount of shade for my tomatoes. I'm glad that I had them put binding on the edges - gives it a nice finished look. I had it made slightly larger than the greenhouse roof dimensions and it gave me just the right amount of cloth to attach into the snap system that I have. Would definitely recommend! Very strong material. I put it on this week. We are having hail and strong winds tonight. I think my plants will be just fine. I would like for the borders and grommets to be sturdier. I think it would also be good to put three grommets in the corner, one in the corner and one on each side about 2 inches away. We end up having to replace our shade cloth every couple of years because the grommets have pulled out. The custom shade I ordered arrived sooner than I expected and was a perfect fit. Very good product for an economical price! This shade cloth is exactly what was described and worked perfectly for my application. And, it came a bit sooner than expected too. I ordered 3 shade cloths for my shade houses. 2 60% and 1 70%. They were perfect... the right size and well-made. They had grommets every 2' and were easy to put up. And they were delivered sooner than expected. We have a pergola in our back yard that faces west and was an unbearable place to be in the summer. Last year we tried a cheap, do it yourself fix that not only didn't look nice, but took several attempts to make it useable and, in ripped in only a few weeks. This year, we happily measured and priced out a shade from GreenHouse Megastore. The pricing was reasonable, so we ordered one. It came quickly and was exactly as we ordered. My husband was able to install it easily and it has already, in less than a month, provided hours of shade and enjoyment! We are SUPER pleased and will use Green House Mega Store again!!! We wanted a large shaded area on our patio. My pergola and your shade fabric gave us what we needed. The large cover was very reasonably priced. Bonus! Saw a project online for a retractable sun shade using something called shade cloth, which I had never heard of before. Could not find the exact size I needed until coming across this site that custom makes them. Perfect fit for my deck and keeps it cool enough to not have to wait until later in the afternoon to go out and sit there.Does not block very much light so it never feels like being under a tarp, and allows circulation of air as it is mesh and not plastic.Great product and have recommended it to a couple of friends already. I was very pleased with the product. It was shipped to me in a very short time. I just received my second cover and just like the one for my garden it is perfect!!! We got this one for the top of our pergola to cut some more of the Texas sun and it looks great and is an exact fit! A few of my neighbors have also purchased covers and are just as happy. Well-made and prompt service. I bought a beutiful white shade cloth to cover my greenhouse and it looks great. I expected a longer wait time because it was custom made but I got it in a little over 2 weeks. Thank you. This site has great service and good quality along with a very reasonable price. The shade cloth looked great and works great. With grommets evevy two foot it stays the same way that it was when I put in on my greenhouse. The custom shade cloth came much sooner than promised. This item performs as advertised and helps keep my GH from becoming a solar furnace. This is the second custom shade I have purchased from the Greenhouse Megastore. I am very pleased with the quality of the workmanship. The product shipped quickly and arrived sooner than expected! My wife and i really like this product. Our appreciation will last only as long as the product will last ... hopefully a long time. 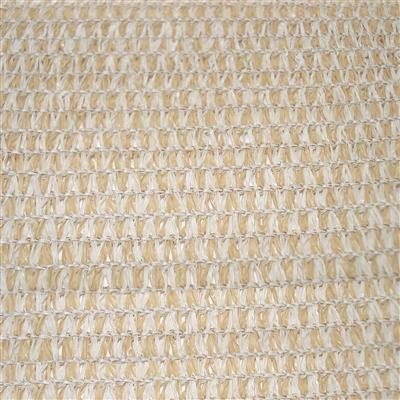 The quality of our sun cloth is good and the order was shipped to us very fast. Our only problem is that the cloth was 2 inches smaller than ordered, and would not reach the brace with the attachment hooks. The order form says that there may be a variance, so be forewarned. Seems like it would be simple to make the things as ordered. Shade with grommets came perfectly to size. Only wish they had no seams in the middle. Bought the shade cloth to block the West sun from my glassed-in lanai and it did the job fantasticaly. I mounted it with a cable and s-hook system so that it could be moved to one side when not required. The 70% sun blockage is perfect for my need. I ordered 2 panels of custom Aluminet shadecloth. Good Points: Correct sizing, fast service. Bad point:about a foot of the binding adjacent to one of the grommets did not connect with the shadecloth material. I did not inspect both pieces. The first went up just fine and when we had the second panel 70% up we discovered the problem. We continued with the installation and did not contact the store because I felt I should have inspected both panels before starting. I would order here again, but do a careful inspection as soon as the product arrived. good quality and fast delivery for my Custom Shade Cloth,got a mistake to parallel the GROMMETS with other side(different about 10 inches. I will do purchase again. I had this made special order to fit my greenhouse. It fit perfectly right down to the inch. I am very pleased. We just installed this over our pergola, and have not had it long enough to test the endurance under winter snows. So far, we really like the shade effect. Ordered three of the custom size sun shades (3ft x 8ft) to fit the inside demensions of skylights on my patio during heat of the summer. They fit perfectly and work great. The only reason I didn't give it a 5 is due the fact that on the three foot demension it would only make sense to me to put the gromet hole in the middle (at 18inches) than at the 2ft on center spacing as stated in their product discription. Not their fault as it was built exactly as described it would be. Just would have been nice. Not sure, maybe could have had it made that way had I talked to someone in person. End result is I am very satisfied and would definately recommend to a friend. Also, product delivered much, much sooner (less than a week) than stated time on the web site. Another nice plus! The accuracy of the custom cut was excellent and the quality of the edge material and grommets seem top-notch.The email customer service responding to my inquiries prior to purchase were prompt, helpful and professional.The material of the shade cloth itself is not what I was expecting but seems to be doing the job just as well. The material is a fibrous plastic that feels like it might not hold up well against long hours in the sun but it has been out in the desert's summer sun every day for a month and I see no change. We'll see what a full year does to it. I went for the Aluminet this time. The order was cut exactly to size and it seems to give good shade. Just hope it is more durable than the non-metallic cloth. Shade cloth is perfectly sized, borders & grommets as promised. Looks great. Delivery even quicker than promised. I've told my neighbors about you too. I bought both the black 30% reduction and the white reflective 40% reduction to aid in my lettuce growing as I was not able to keep it growing through July-Sept. as it gets too hot and the sun is quite intense. And I'd like to say that I am finally able to grow during those months because of the shade cloth. A matter of fact many of the vegetables do better with a little less sun and heat. The white is particularly good with lowering the heat (because of its reflectivity) in the raised beds that I have. A very good product and would recommend to anyone. The sunshade was exactly what we needed to shade the top of our pergola! It let's light in without the heat of the sun. We can enjoy our patio now! I was very pleased with the quality and the color is perfect. We needed a sun blocker for the front enclosed porch and this is doing the job. So many trees with leaves and hickory nuts..perfect to keep them out of the pond and yet to let the sun and light in. Took a chance ordering a product without seeing it for real. Ordered a cloth with 80% shade, but it looks and feels more like 30-40%. Also disappointed that the fabric (measured across the middle length-wise) was 8 inches longer than the measurement edge-to-edge, so it doesn't lay flat on top of my pergola. No more buying without seeing first. My shade cloth arrived earlier than expected. The color is fabulous. What a huge difference it made on our deck. We love it! Wish I could post a picture. Ordered an 18'x22' 40% white custom shadecloth with taping (edges) and grommets for a hoop house I constructed. Very pleased. Quality craftsmanship that has thus far withstood the rigors of snagging and stretching that I've inflicted. I only withheld the 5th star rating pending it's test of longevity. I'm pleased with the ease of shopping at the Greenhouse Megastore, shipping in a timely manner, and far superior pricing to others I researched. I plan on using them for future purchases. Nice shade cloth. Unfortunately, I forgot to check the box for edge tape and grommets (which is the reason that I did a custom size in the first place!). Don't make the same mistake that I did! I needed a sun shade to attach to my awning. I showed your custom made sunshade to the awning company's salesman. He said it should work well. I installed it yesterday and it worked perfectly. The grommet border was perfect for my installation. The salesman took photos of my new sunshade, to show future buyers. Everything came as described and faster than promised. Excellent quality came fast and was correct length. We've only just installed it (to cover a long and narrow alley beside our house where we intend to grow ferns), but from what we can see so far it is exactly what we wanted. The color and texture are exactly as advertised, it was cut precisely to our specifications, and the borders and grommets seem sturdy and durable. We purchased the custom 70% aluminet shade cloth to use for shade for our dog for outdoor events. We either cover our entire car with it or use it as a side panel to augment a tent. It is fantastic! Lightweight, lots of grommets for securing, and plenty of breeze can get through. We love it! Excellent product!! We bought the green cover for our greenhouse. The color matches the metal roof on our house and goes great with the red cedar of the greenhouse. It drastically reduces the heat in the greenhouse. I love this shade screen. Our patio was just too hot before, and this has made a huge difference. I like this color. We got a 70% shade, and 85% or 90% might have been better, but I think that would have had to be black, which I'm not sure I would like as well. Overall, very happy. Easy orderingFast deliveryProduct as expected for use as a sunscreen over our pergola. It provides just enough shade to make it comfortable without the heavy feeling @ 50% coverage. Would recommend highly. I ordered a 60' x 190' taped and grommeted 50% shade cloth. The order came perfectly and ahead of schedule. It also survived 80 mph straightline winds with little to no damage. I RECOMMEND THIS PRODUCT HIGHLY!!! We are so happy with our shade cloth. it's perfect! Product was exactly as advertised. Quality is solid and custom measurements were perfect. I would buy again if the need arises. Custom shade cloth has been in place for about 1 month and is effectively shading our animals. Product and workmanship appear to be excellent. Would definitely buy from Greenhouse Megastore again. Our rectangular south-facing patio covering is made livable in Pasco's summer heat with two Shade cloths. Above a 12' by 13' piece drapes over wooden supports. On the west-facing side, a 4' by 13' cloth cools the late afternoon sun. Pasco is famous for periodic 40 to 60 mph winds that can last hours. Those grommets every 2 feet really hold! I share your website a lot! This shade replaces a 10 x 12 pergola shade. I used bunjee balls to attach it to an existing pergola and can't complain about the fit. It's not exact but it's better than nothing and lets the wind and rain go thru so I don't need to take it down. 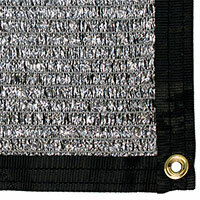 Shade cloth is excellent quality and grommets put in as described in advertising. Shipped on time. Good price also. Found out the hard way not to put to much tension on the corner grommets. Recommend strengthening the corners. I use the covers over 9 feet tall soil beds and tie the sides to 2 X 6 tray around the top of the bed. After years of trying to make our own shade cloth, we found a place that does custom sizes - it was actually less expensive than making our own! Cindy did a great job. Absolutely fits perfect! Thanks so much, keep up the good work. We special ordered a shade cloth to go over our above ground garden. We are disappointed because it's more like a bird net than a shade cloth. I live in central Arizona and had just planted a banana and sugar cane along with several other typical garden plants. The banana was suffering from sun damage already in April. I put up the 30% black sun screen and literally two days later I could tell it was saving my banana plant. Now all the leaves are full and green without sun burn on the edges. Fantastic product, exact size, great price and workmanship. Arrived on time. Quality shade cloth, easy to install. Great shade. Very easy to order. Fast shipping. Came exactly as ordered. The custom order for the shade cloth was perfect! The price and quality were both exceptional! When calling customer service, prior to ordering, the representative was extremely helpful and very pleasant. We use the custom shade cloths, 40% White on shade houses in Haiti to grow food. They lower the temperature inside and shield the crops from UV rays. We are extremelly pleased with the results for performance and toughness during the hurricane season. Product delivery is timely and we are happy to have Greenhouse megastore as our supplier. Nice to have shade made to fit my needs. My hobby greenhouse faces a southern exposure and the clear panels permit a lot of sun to shine through, making the greenhouse very hot in our southern summers. 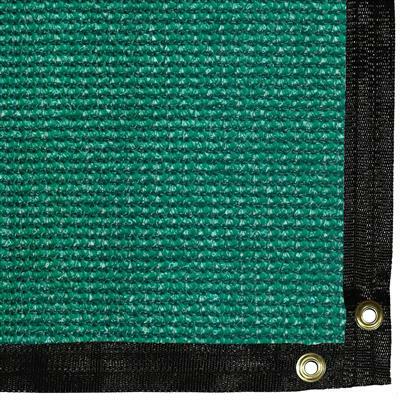 I ordered a custom size cloth with grommets every 24 to cover the south wall and the top. The 40% cloth looks like it will do the trick. After placing the cloth over the greenhouse I drilled small holes in the metal frame adjacent to each grommet and fastened it down with plastic cable ties. The cloth provides an additional benefit by helping to hold the panels in place in high winds. The plastic gaskets have become brittle over the years and they will pop out when the panels vibrate. I have been unable to locate replacements, so the cloth does a great job of minimizing the vibration that makes them loose. The mesh of the fabric is also loose enough that even when it's tied down I can open the ventilation panel in the roof. The purchase turned out better than I had hoped. Great product. The website said that delivery would be delayed, but my 5 pieces of custom shade cloth arrived in less than two weeks! The pieces were accurately cut, finished well, and look like they will last a long time. I am pleased. We came upon the Megastore by accident while searching for replacement screens for our extended carport. We made an error in measuring for one area that was not framed out and the screen was to big. I hated it to look sloppy so called the store and they were more than happy to help me. The screens look wonderful on the carport. Very good product and I love the way they are trimmed out. My RV is stored under cover but is exposed the morning and afternoon sun at the front and rear. I had two custom shade cloths made for each end of the RV to shield it from the sun. The quality of the shade cloth is excellent. It was made exactly to my specifications and fit perfectly. Great product! The product sizes as ordered were accurate and the quality of the material is great. My 13' by 14' grommets-every-two-feet shade cloth installed perfectly on my patio with just eye hooks. The shade cloth made my patio enjoyable during our hot eastern Washington weather. Love it! We have a lake house in TN. We keep our boat on a lift on our dock. The dock has a roof but is open on all sides. I bought the shade cloth, in specific sizes, to use as side curtains, for UV protection. It is doing a great job. Really unsure of the item as with it being end of our summertime season. I won't be putting the shade up until next summer season. We ordered a custom shade screen and it is working perfectly. It's durable, heavy duty and should last years. It looks cool too and our tomato plants are very happy now. The product was exactly as I had expected. It arrived at least 1-2 weeks before it was scheduled. The stitching and grommets, as well as the fabric were excellent. Would not hesitate to order more products. I like the product and pricing overall. My first order was perfect. Unfortunately, the 2nd order had some of the eye loops missing on one side in spite of an inspection tag. I did not want to go through the trouble to send it back for replacement. 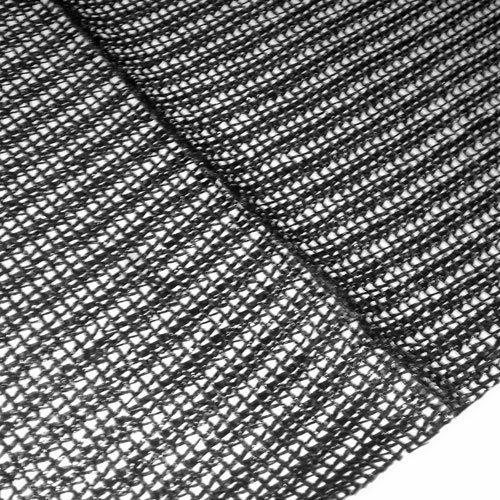 Purchased black 80 shade cloth for a new pergola. The fit was perfect and stands up to the wind after tying down to frame with bungees in grommet holes. Just completed project so I don't have long term results. Just as advertised. The shade screen is the perfect color, nice & light, and gives just the right amount of shade. I'd give it a 5, but I haven't had it long enough to see how well it lasts. We ordered a custom shade cloth for our plants. This shade cloth has been great! It has made it through a few very violent storms and the plants couldn't be happier. Thank you for selling a great product! my plants in the green house love it and it has held up well through some strong thunder storm. really like the shade cloth. It looks good on our pergola. I purchased the shade cloth for a cover for my raft. It's the perfect thing. I've used plastic tarps for years. They are heavy, hot, and don't last. The shade cloth has eliminated all those problems and has proved to be a fantastic cover. I highly recommend it for this purpose and I'm sure it would work for anyone wanted shade either on the rivers or anywhere else. My recent order of a custom tarp will be the fourth order I have placed with you. I have always been completely satisfied with every aspect of ordering from you. Your products are excellent, good craftsmanship and always a very fast turnaround from placing the order to receiving it. Your customer service is by far the best I have ever had the pleasure to deal with. I hope you will be around for a very long time so that I can continue to order from you. Thank you for what you do. I needed partial shade for a pergola my husband built in front of the potting shed. The custom shade provides the amount to make the space comfortable. It also allows light for all of my baskets and pots of flowers. I would highly recommend this product. Another neat feature is that rain drips through it which was not an option if I had made a shade out of canvas or some other outdoor fabric. After purchase, no information was provided regarding shipping, dates, etc.Finally received a response that the manufacturer would EDD on a certain date. Not sure what EDD meant i.e., Departure Date or Delivery Date. This response applies to all three shade cloth sizes I ordered. Should have ordered much sooner as the hot weather arrived before the tomatoe buds had a chance to set. The earth remains moist with less water by virtue of your shade cloths. This replay pertains to the other items shown in this review request. Just what we needed for our patio to block the brutal afternoon sun. Thank you! I measured the spaces for 5 different custom shade cloth panels 3 times before ordering. BUT 2 of the 5 were unusable. I called the company and was able to return 2 pieces, only to be told that I should have expected up to 4 variation in measurements! I haven't gotten the replacements yet, but I will not order from this company again. Looks like a well made product, fits my patio cover just as anticipated. I only wish I had ordered a 80 or even 90 percent instead of a 60, it's not dark enough for a hot day. Nice shade cloth. It's light and will be easy to store for the winter. It fits beautifully in our greenhouse. I had it custom made and it took 3 weeks to even make it. I do not recall seeing that at checkout time but I was tersely reminded of that when I called to check on my order after a few weeks. Three weeks? Really? Maybe time for a new employee? Even on a custom sized item like this, which is not hugely difficult to cut, bind and add eyelets to, three weeks lead time is excessive and indicative of a company that doesn't value customer service. This product is great. The buying experience was a negative for me and will come in to play during consideration of future purchases for our greenhouse. ###Although there is nothing we can do regarding extended lead times for our custom shade fabric (the lead times are clearly posted online) we sincerely apologize if our customer service staff was anything less than professional and cheerful regarding your inquiry. Good product, made well and accurate. I like the idea of the person doing the job signing the tag , good job.Your shade grading is good, I purchased a 70% shade ,I should have done 90% but I know better for next time. exactly what I ordered. Fine quality, excellent product. We have a Homemade Hoop House and needed a section of Piece of Shade Cloth cut to exact dimensions. The dimensions were very important since we already had hooks attached to the Hoop House. We placed our order, it came sooner than expected and the dimensions were perfect. Installation was done in minutes !! We were very pleased. I ordered two custom pieces. I ordered one too small, emailed for an adjustment and had a quick response. But when product was being installed one was cut and sewn completely un-square. Exactly what we ordered. Exactly what we needed. We looked thru many websites for a sunshade to go over our patio pergola. Everything was the wrong size & way too much money. Greenhouse Megastore offered a custom made sunshade to fit our needs at a very affordable cost. Shipping was faster than time quoted & we are so happy with the final product. There will be many backyard bbq's in our family's future! Our shade cloth came quickly and was the right size. It was easy to attach to our pergola and provides the shade we wanted..
After purchasing Aluminet previously for a greenhouse, I outfitted my pergula (32'x16') with two different sizes of Aluminet (30% and 50%).We found that 30% is perfect for squash, apple trees, strawberries, and 50% is perfect for tomatoes, celery, leafy greens etc. When you live in the Mojave Desert, you have to improvise. Nice work. Right on as far as measurements go. Wished I would have gotten 90% though. We draped the shade cloth under our patio cover to catch the pinecones falling through the boards on us from our neighbors tree and catch most of the needles we have to sweep up 3 times a day. Now we just lower one side to empty it out.We love it. the shade cane in faster then I was told. it was the right size and covered my patio just right. I would have given it a full 5 but the grommets could have been just a bit larger. I had a bit of a issue getting the rope I was using threw the grommets, but other then that it was just as I expected. Sturdy yet light weight shade cloth was easy to install with close grommets. 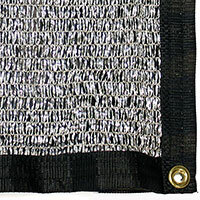 Shade cloth was made to order with grommets and binding. Went 40% shade for miltoniopsis. Well made, light weight aluminet, just what we wanted. Didn't pay attention to the notes in the order that they take 2-3 weeks and this one took four. But quality is great. Custom made cloth is well put together and fits my application perfectly. My rose are now happy and protected from the sun!! Product just as described on website, delivered quickly. shipping was resonable as was price. Quality product. The quality of the shade is outstanding and so easy to install. I purchased the shade to help keep our greenhouse cool from the intense Florida heat in the summer. We will not know if it is effective for a few more months, but, so far it's been great. I talked to customer service about this before buying it and they told me I could suspend it from 4 corners under tension w/o sag in the middle. This certainly was not true when I attempted it and the eyelets pulled out under minimal tension. Then customer service did not allow a return. I come to a company like this for expertise and customer service and accept the fact you may have to pay a premium. I got neither expertise or customer service which reminded me to just use Amazon. I received my order within 3 weeks as promised. However, I was quite unhappy when I received my white shade with black tape. I strongly believe that the fact that the tape will be black should be clearly disclosed IN WRITING when placing the order. I called customer service and was not given any options to remedy the situation. Customer service was pleasant but not helpful. Product was sent on a timely basis and was exactly what was ordered. Definitely would order from this company again. Excellent value and well crafted. Exactly what we ordered and delivered when promised. I will order more of this product. I bought our shades through the Greenhouse Megastore; but really, indirectly from Green Tech, which I found out later is the actual company. Our shades were to short when they arrived, by two inches. I called the company. The rep indicated the tolerance was +/- 4 inches; and that they do list this right there next to the custom shade options. True, it's there, but it's small, and it's not where it should be, right next to the order button. My opinion only here, but BEFORE you click, confirm order, you should be required to acknowledge this tolerance and revise your measurements accordingly if you think you should. But, when I talked with the rep at the company, not only was she understanding, but offered another shade at 50% off with free shipping. True, we can make our initial shades work creatively with some zip ties, but it was refreshing to deal with a company that clearly wants our return business. Our shades are so well made that we would recommend them to anyone; whether it's for shade for you or your plants, or even to cool your patio or pool deck down. These have many applications. We're using them in a garden shade application, which is almost mandatory in Central Texas. Thanks for a GREAT product, and even better customer service. You will get our recommendation, and our future business. The shade cloth was perfectly sized; if there was any error it was mine in ordering only the 50% blocker for our Southwest sun! I'm going to order another for the summer season. This is my third visit for this shade cloth. The 70% smoke blue made to fit my dimensions is just perfect to keep the hot summer sum off my Southern exposure windows. The ac works less now, and with our fogging system we enjoy out ourdoors in the hottest part of the say in great comfort. These folks are wonderful to deal with also. The custom sunshade is just what i needed for my oddly shaped patio area. the texas sun can be brutal and now my plants are perfectly protected. Very well made. Excellent quality. Fast shipping on our custom made cover for our greenhouse. As usual, the customer service was first class. love the light weight cloth... easy to install.It will make a huge difference on the longTexass days this summer. The material is good but the grommets are not holding up after two weeks of use. The shade cloth was made exactly as specified, very nice work. It is ultra-light, so be sure to keep it guyed. My only complaint is that aluminet material is prone to snagging on sharp corners, and is rather fragile when snagged. Be sure to pad sharp corners! Otherwise, this is a fine product. I'll know more come summer, and will update. The shade was exactly to order and works very well. I will be ordering again from this site. I highly recommend them. The custom 30% shade cloth is well made, arrived in a timely manner, and will fit the bill perfectly. I bought this shade cloth in an attempt to keep greenhouse temperature at a minimum. 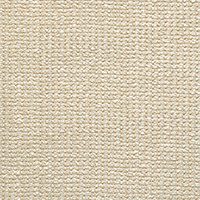 I can tell no difference between this and a woven shade cloth, in terms of heat reduction. It is very light in weight, which makes it vulnerable to wind. It snags on sharp corners very easily, and tears very easily. I'm not sure this shade cloth is worth buying. I will revise this review next summer, after I see how it handles serious heat. Great product for the price! Used to cover a large skylight to reduce heat in a large business lobby. a little stretchier than I expected, so if you are using this within specific dimensions, I would short your order by 6 inches per every 10 feet (estimated). I have bought a custom sunscreen two time from Greenhouse Megastore. My orders were exactly what I ordered to the measurement. The quality of their sunscreens are of the highest. I would recommend this Company to anyone looking to buy sunscreen. We are very satisfied with the color and material, but the grommets were not done with precision. One is totally torn at the corner and is not holding already. A second is fraying already. The shade is just the size that I ordered, good quality material, and very well made, with strong binding and grommets. The next time that I order, I will specify where I would like the grommets, so that they would match the frame of my greenhouse. The construction and shipping was very fast. I bought a 16'x9' shade cloth with brass grommets at the edges. The cloth is of good quality, and the edging and internal grommets proved adequate, but the four corners were not well made: the sewing was weak and the grommets were placed too close to the edges. As a result, a little wind tore off two of the corner grommets and damaged the other two. Product is beautiful and will enhance the top of my new deck. Worked out great. Cut to size and blocks 40% of the Sun. Our veggies grow so much better now. I bought custom size shade cloths for the east & west sides of my camper cover. The cloths are doing a great job! My only complaint is that the grommets aren't evenly spaced on one of the cloths making it odd spacing when I tie it down. Function is still great! The shade cloth is being used for a pool cover. It is perfect in size, ease of putting on and I'm very pleased. It should keep a lot of leaves out of the pool. We needed something to provide shade inder our pergola. This 50% shade material works great - so pleased we found the Greenhouse Megastore! A very well-made product. Shade cloth arrived sooner than expected too. A very good product for the price. Fantastic - fits perfectly and is really helping the garden in the Texas sun! I don't usually leave comments about products, but this time I felt I had to. I ordered once before but wasn't sure about how well they would hold up. They were right on the money, with custom size fitting, quality, and the items came faster than stated. And so I ordered twice more. Thank you from a happy gardener. Seriously. Correct size, made well, & delivered quickly, all at a reasonable price! I custom ordered the black 90% fabric with edging and grommets to cover my pergola. I received my order within 2 weeks which was much faster than promised and the size was perfect. The fabric makes a huge difference in the heat level under the pergola and we are extremely happy with it. We had hoped that the fabric would be dense enough to block out most of the rain too, but that was not the case. Overall, the service, speed and quality are excellent with this company and I would give them a solid recommendation. We ordered some bound shade cloth to go over an arbor. It came quicker than promised and when we did have a problem with the placement of grommets, they took care of it quickly. although the time between ordering and delivery was a bit long, the product is awesome and exactly what I ordered. great job. expect more of my business! We put the shade cloth on top of our patio cover to give us some shade and relief from the hot sun and it works great. It was quick and easy to order a custom size and the price was great. This is the best shadecloth product I have seen. It is lightweight, strong, and energy efficient. My orchid greenhouse is cooler since I removed the old black shadecloth and replaced it with the Aluminet, which reflects light in all directions, and doesn't trap heat like the black stuff. I can't wait to see how it performs in winter here in north central Fla. I ordered a shade cloth to cover a pergola that I built this summer. I am very pleased with the quality and the result. It arrived in relatively short order. It seems to be well constructed and works perfectly for it's intended purpose. When the time comes for a new one; I will again order from Greenhouse Megastore. So far so good...though I've only had it up for about 3 weeks it works perfect for what I wanted. I used the sun shade across the top of my pergola and it gives me great shade coverage and even helps keep the sun/heat from shining in my patio door. Will probably order a back up to have when this one wears out but hopefully that will be years down the road. Great product. No doubt this has saved my garden for 2 years in a row now. Highly recommend. Measurements were spot-on (custom order). 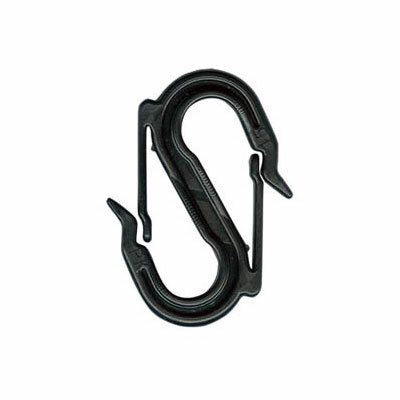 Product seems very durable, and certainly makes a great difference in temperatures. We were very disappointed in your product. When we opened it up it had been patched. I am VERY satisfied with my shade cloth. It was made with the exact dimensions ordered, the border stitching and gromets are exactly as expected. I could not have asked more and the price was right ! The custom shade cloth we ordered , fit to a tee,it was well made & the 40% recommended was reommended & the temp in the unrolled up shade cloth was at least ten degrees cooler, thank you so much,who ever made it did a GREAT job & should get a bonus for their work, will recommend you highly to others,thank you again so very much! We live in central Arizona at 5000 feet. The summer sun is brutal to our garden. We ordered a 50/50 custom shade to cover our entire garden and now everything we have planted looks like its growing in the jungle! The plants doubled in size in less than two weeks. We water once a day instead of twice like we used to. I can stay outside working in the garden much longer because its at least 10 degrees cooler. We now have a paradise in the high desert of Arizona. My gardening neighbors are amazed. When a plant description says 'full sun', they aren't talking about Arizona. Plants here need some shade! Wish I could post some pics. This shade was to keep our vegetable garden from burning up in the Texas summer heat. It is sturdy and is doing exactly what we bought it for. Great product, and it was shipped quickly. We had a custom made shade cloth made to cover our pergola on our back deck. It arrived ahead of time, was very well made, is sturdy, and will last multiple seasons (we shall take it off & store during half the year). Frankly, I was pleasantly surprised at the quality and effectiveness. We went with the 70% and works even better than expected/hoped for. Thank you. Perfect arrival timing given the current heat wave. Well made, fits perfectly on my homemade shade/green house. Shade cloth is exactly as advertised; binding and grommets are sturdy; cloth I ordered fits the space and shields porch from hot afternoon sun. The shade didn't fit the measurements given for the greenhouse. You used up more than the +/- 4 inches. The grommets weren't the same distances from side to side. ordered shade cloth to weave through Pergola on W side of house. Arrived earlier than promised. Very pleased with quality. Had it bound & grommets installed. Installed in less than 1/2 hour using bungee cords. I purchased a red rectangular shade clothe to use as a temporary summer shade area in the back yard and I love it. The shade cloth, taped edges and grommets were well made. My only caution is to make sure the shade cloth does not rub against metal, esp in very windy areas. I ordered a custom sized shade cloth for an outdoor structure and received it in only 2 weeks. Very pleased. I came back here after purchasing a greenhouse from them several years ago, have nothing but nice things to say. Oh my goodness what a difference the SHADE CLOTH makes. We now hang outside a lot more. The price is great...the speed of delivery was amazing. Most of all it looks great and keeps us so much cooler. Thank you! Product was exactly asadvertised and was easy to install, we had ordered with the binding and grommets. Would highly recommend and would order from this company again. Shipped faster than we thought and gives alot of shade to our deck. Before the shade cloth we could not use deck mid day, way too hot. Now we use our deck all day long. The product is well made and I have no complaints. I do wish I had spoken to a sales rep instead of ordering online. If I had discussed what I wanted to do, I think you would have advised me to order a tighter weave. My purpose was to protect my plants from the afternoon sun in southern Nevada and myself from sunburn. Fabric is super sweet. Production/shipping slow. Substandard quality--edge tape is not especially solid, and the size is a bit off (too long, too narrow.) Fits price range, though. Long story short: saving money? This is fine. Want more? Shop elsewhere. In spite of the admonition to expect a long wait, the product arrived within a week from ordering and I was pleasantly surprised at the workmanship and consistency. I ordered a custom cut 800sq. ft. 50% reduction product that I installed over my patio on top of a pergola. Wow, what a difference it made for summer comfort. I used a search engine to dig and find this place and spent a fair amount of time on-site until I discovered that one doesn't have to buy just a pre-cut size. It appeared that the custom fitment is priced at the same rates as pre-cut....thanx for a great product. Great service and price. Shipping was very timely with my item arriving 3 days before expected delivery. The cloth is very good quality and dimensions were spot on. My family that came and visited remarked how well this cloth shaded and have new ideas for using it in their future outdoor projects. Very pleased. The custom shade cloth was larger than I ordered so it does not fit as well as I hoped. Disappointing since I spent so much time constructing a frame to make it perfect. My first shade tarps were perfect fit and finish as well as material. They lasted four years which is satisfactory. The recent replacements, provided by Green.tek are a disaster. Poor quality from all aspects, size, materiak and workmanship. I doubt these will last a single season. Unless GM can assure me that they have a relaible vendor to replace Green.tek I will go elsewhere. I received just what I ordered. It was cut to the exact specifications. I use it to cover part of my greenhouse. The grommets work great for tying down with bungee cords. Can't rate durability yet but it looks like it will last. Good shade cloth. Sorry for delay in responding - all installed today - extremely easy to put up - handled well - and just in time for our summer sun to keep from having fried tomatoes. Fit as ordered and fast delivery time will order more when needed. I ordered this custom sized shade cloth as a replacement for a canvas gazebo top that lasted through about four years of Kansas winds. After looking around for a canvas top and pricing made to order ones, I realized it was less of an expense to buy a whole new gazebo. Then this spring I noticed our local zoo using shade cloth for gazebo type tops and decided that was the way to go. I am very happy with the fit as well as how it looks, not to mention the fact that it should hold up many years to the winds. The workmanship is also top notch with the grommets along the edge to attach the shade cloth to the gazebo. We opted to go with the shade cloth zip ties and they work perfectly. The only thing I would say is that I wish I'd have ordered 70 or even 80 percent shade as the 60 is not quite as much as I'd expected. I would recommend if you are wanting to use the shade cloth in the manner I did to go with the higher shade percentage. That aside I was very pleased with my order and the service. I really like my shade cloth. I placed this over a new deck I built for my houseplants to prevent burning in the hot summer sun. One grommet broke and I had to tie around the bunched up corner cloth. Would be better if grommets are more reenforced, at least the corner ones. However, I hardly look up to see the rig job. From afar, it really looks cool. I have a photo I could provide to show the awesomeness. Very nice and great looking. Looks to be very durable and strong. Only had it on my greenhouse for a week or two, but is holding up very well. we have had our custom made shade cloth on our pergola for appx. 2 months. Received it within 2 weeks. Had at least 3 storms to go through with up to 70 mph winds and hail and have not had any trouble with it tearing are grommets pulling loose. Well worth the money would buy another one. Exactly as ordered, good quality and the 60% shade is perfect for orchids and other tropicals. Couldn't be happier with the product & service. Comes shipped with the name of the person who made it to our specifications and she did a great job! Will order again. I just got mine and have had it up about a week. I like the look and love the difference it has made. My tomatoes were cooking in the full sun garden. Now they are much happier.I was surprised though about how far apart the grommets were and how misshapen the whole thing turned out to be. I thought the description said the grommets were 2 apart not 2'. So I was expecting a LOT more for the extra money I paid ($30+) over the competition's price for grommets ever 2'. I would also recommend adding about 2 inches to your measurements if you order custom size like I did. It fits perfect in some places and is about 4 inches short in other places, NOT SQUARE. I went with 16x24 foot area of coverage. I think it might have been easier to hang if I had ordered (2x) 16'2x12'2 and hung them separately or seamed them in the middle myself once up. It seems to be a quality product. I first bought 80% and was not dark enough so I then bought 90% and placed it on top of the 80%. It is now just right. Shade clothe came right away and was of very good quality and the correct size. The only complaint I have is that the cloth was bunched up as the rivets where sown on and made for an uneven and sloppy appearance when pulled down tightly. Too much trouble to send back. So we'll have to live with it. Quality control slipped up. The custom Shade Cloth I ordered arrived when I expected it. It is very well made and was the exact size I specified. 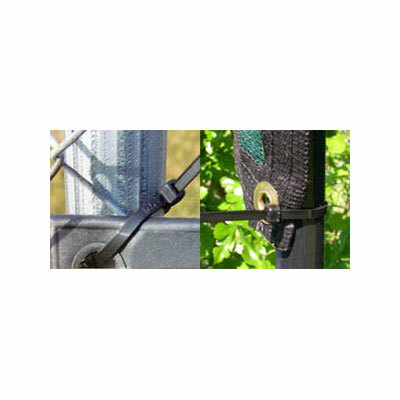 The grommet spacing of 2 feet prevents the wind from blowing it around. I attached it to the greenhouse base with bungie cords to keep it tensioned. I needed to cut into the material to allow roof vents to open. I taped them at the edges and all is working very well. The shade material (90% shade) is keeping the inside temperature in the 70s where it had been in the very high 90s, sometimes in the very low 100s. 15 X 15 shade cloth for the top of my pergola is very well constructed.Price was reasonable for a custom size piece. If I get 2 or 3 years service out of it I will be back for another. Good, but pricey for what it is, IMHO. Avoid metal grommets, go with the plastic. quality of the shade cloth is good, seems to be very durable. We are in a condo and are using the cloth to give us relief from the afternoon sun beating in the sliding glass door and also to shade our plants. We are extremely pleased with it. I just received my 70% beige sun shade which i plan to place over my pergola. Maybe I was naive, but i thought it would be similar to the material found on patio umbrellas. But what I found was the material not as tight knit as I expected. In fact, water seeps right throught it. Like I've said, I was expecting more of a canvas type material than what I got here. So be aware what you are ordering. Shade cloth was of the correct dimensions and constructed of high quality material. Very satisfied. Ordered for our deck that was 1/2 covered & 1/2 open. Loved this product so much ordered another for our other deck. Amazing how much cooler it made it under the deck and how well made it was. Would recommend to anyone - Great Product! Great product- love it- great on the pergula (16'by 24') Will pass the good word. This won't be the first time I buy custom shades from this company. we purchased the 30% black 25'x25' sun screen.even though i kinda wished i had gotten the 60%, this still reduces enough sun, to keep the garden plants from stressing from the sun down here in Louisiana. The quality of the material and work(wo)manship :)is very good indeed. EXCELLENT does what we want it to and works perfect! It was easy to install and the results wera just as expected. Very satisfied. Product exactly as described. Great value for money. Loved ability to order exact size I wanted. Shipping and receiving faster than advertised. Very satisfied. Cloth seems to be OK so far. However some of the grommet holes are torn and I could not use those holes. I was very disappointed with the quality of the screening we received. It lacks strength and is seamed. It is still in the box as I do not feel secure using it for the intended purpose. Would not order from this company again. Shade Cloth has a great quality. Ordered 3 panels. Two were 5' X 24', one 4' X 24' Takes a little time because they are custom cut. Webbing on the sides and gromets make installation a breeze. Place over an existing kennel. Had them up in about 2 hours and could have completed the job but ran out of zip ties on the last panel. Just the right amount of stretch. Dogs are now ready for the hot summer sun. Finally found time to install this shade fabric. I got the taped edge 18.5 ft x 18.5 ft custom panel. I had requested that the seam be right in the middle. Got exactly what I asked for and the dimensions were perfect. 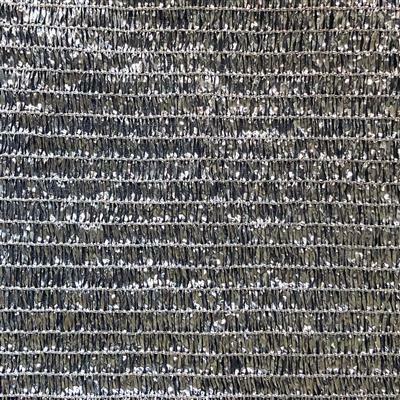 The shade fabric itself seems to be of good quality; not too flimsy and pretty dense weave. The packaging was very good. I had stapled my fabric to the top of my pergola; if anyone else is going to do this, I'd recommend buying some of that same tape used on the edges for the middle area stampling. Great customer service. Speedy delivery. Fits perfectly on top of our pergola. Great Product,works well. I am using it as a shade curtain to shade the west side of our patio. The shade cloth is awesome!! Shipping was a little slower than we would have liked!! The product arrived on schedule. The seams were straight and pieces square. I was very pleased. Time will tell how it withstand the sun. This was the best shade cloth ever, exactly what they said it would be.. Great company to deal with. Would recommend them anytime, in fact getting ready to order more.. Tape and grommets are firm, looks as good as the 50% I bought last spring, which was a bit too much for my latitude. Live and learn, I suppose, but I'll stick with quality. I ordered a custom shade cloth with grommets. It was perfect, shipped very fast and I am very please with the service and products of Greenhouse Megastore. I ordered my cloth in mid winter and had it in under a week! Product was exactly as described and delivery was very fast. Very satisfied customer. Nicely sewn sunshade - delivered fast -- and worked perfectly to shield my dog run from sun and wind. What a great company - good customer service, fast delivery of a quality product.....what more could you ask. Not really a good time to review it as I won't use it until next April. But it appears to be the right size etc, looks nice and arrived on time. Thanks! I have a glass greenhouse that I could not put shade cloth on the outside due to homeowner's association rules. I ordered custom sized 60% Aluminet for each interior row of glass and suspended it with tension curtain rods. The grommets were slightly too small for the rods, so I sewed hems on the top and bottom to slide the rods through. It worked beautifully. I am so thrilled with the results and your custom sizes I ordered fit perfectly (even though you state that they can vary up to 4 inches - they were perfect). They arrived very quickly (w/in 2 weeks!). I am so happy. Even my husband was impressed. Your company was the only one I could find with the variety of Aluminet, a GREAT price and willing to do such custom work so quickly. My orchids and I are very happy! Thank you again! I built a canopy for my 5th wheel trailer, 41 feet long, 18 feet wide and 16 feet tall. I installed the 90% black on the top and 70% green on the sides. It is remarkable how this product reduced the interior temps in my RV.Note, the factory states that grommets are placed 24 inches apart. Be warned if you pre-build mounting points for the grommets. A number of my grommets were placed at 23 and less inches, making installation difficult for bolts I welded onto the top of my canopy. Otherwise, the product is outstanding. I had an idea formulated in my head of a solution to my too hot patio. The sun shining on my east facing concrete was unbearable. The concrete could literally burn your bare feet. I had to do something to reclaim my space from the hot Texas Gulf Coast summertime. I wanted something lightweight, easy to deploy and economical. This product fit my needs perfectly. It cut 50% of the sun and a lot of the heat. Of course when its 104 outside it is even hot in the shade. but at least the plants are doing better. And the space is an enjoyable one now in the early morning and late afternoon. Fall is coming so I may need to take the shades down. No worries. They come down in a minute and fold up like a blanket, easy to store. Perfect solution to my problem. Stoked! Quality of product was good but I got gromments when I did not want them. I thought about sending it back but why?? Cost and time were more than I was willing to invest. I will know better next time. Talked to company when ordering. Was told that grommets would be approx. every 24 inches. 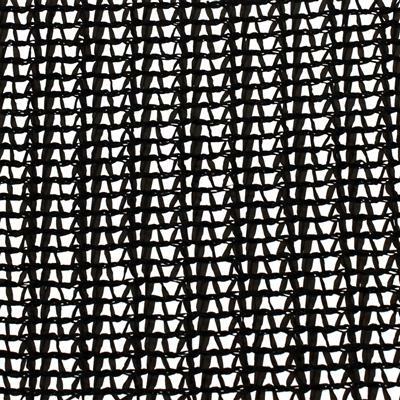 Shadecloth arrived with grommets on the 30 ft length at anywhere between 12 and 36 inches. The custom sized shade cloth came as ordered and faster than the stated delivery time. It was well made and fit perfectly. I was unsure of how to order by size and shape. The CS helped me to measure properly and order the perfect size cover for my greenhouse. It arrived and fit perfectly, just as I was advised. I appreciated his help in getting just want I needed in size, shape, color and price Thanks! I order a custom cut piece of 70% shade cloth with grommets. I received it within 3 days. I put it up as a canopy to help shade the south & west sun from coming in my bay windows on that end of the house. It worked wonderfully. The grommets are holding very well in the wind and the 70% shade is perfect! I would totally recommend this product for an application such as mine and it would probably work for any/all applications. I custom ordered a shade cloth, my first time dealing with Greenhouse Megastore. I was concerned because I couldn't really see the product and had to rely on your company.Once the package arrived I knew I had made the right choice. Professional finish on the edges and the seams. The size was to my exact measurements. It was perfect. It really completes our deck and it has made it useable again. Our deck faces the south and the shade cloth provides with shady comfortable place to sit even on the sunniest days. Thank you, I will be shopping with you again. I am very pleased with the two custom shade clothes with binding and grommets that I purchased. 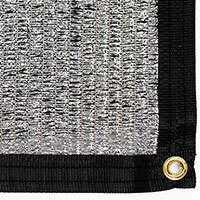 The items are high quality with very neatly done binding and grommets which look good and should last for some time. I purchased a 60% shade cloth 3 years ago and fitted on a wooden structure above my patio. Today the product still looks new. I would purchase again or recommend to anyone. Very pleased with product, grommits,& its construction. Put it up immediately upon receipt. Wished I'd made it slightly bigger and higher percentage darker because we're burning up here in Texas. It MIGHT save my flower garder but didn't order it in time to save my daylilies. Should have ordered it in May. Excellent product, worth the expense. My custom shade cloth arrived sooner than expected and met my expectations fully. It looks good and fits the space perfectly. I order 5 custom shades and we are very happy with them. They are nicely finished off on the edges. We hung the shade cloth on our iron gate with zip ties to block the view of our shop from our undesirable neighbors. It worked perfectly & looks good too! Great quality and fits like a glove. Very satisfied with product. The custom Shade Cloth That I ordered Was PERFET! Everything was great quality. The ship time was a little slow,but I'm totally pleased with the product. Delivery of the shade cloth came on time. The website helped us choose the right type and it works great! Quality materials and construction. I was a little concerned that your product wont be as good as other products because you were cheaper. upon inspection it. it was great. waiting to use it, lots of storms here.